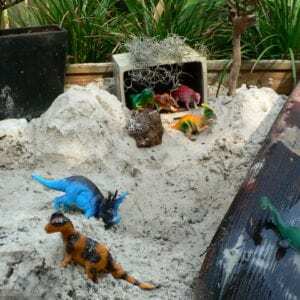 PudStars fairy garden is well over a year old now and still going and growing strong – see it last year here. I don’t often notice her sitting and playing with it but almost every week I find she has re-arranged or added to the furniture, painted something or added a teeny tiny treasure to the garden for fairies which may stop in for a visit. The first few days of the Christmas holidays have been spent in her Art Studio (she re-named the cubby) creating a glitter covered turquoise picket fence. The teeny tiny pine tree which we planted last year has also been decorated for Christmas. 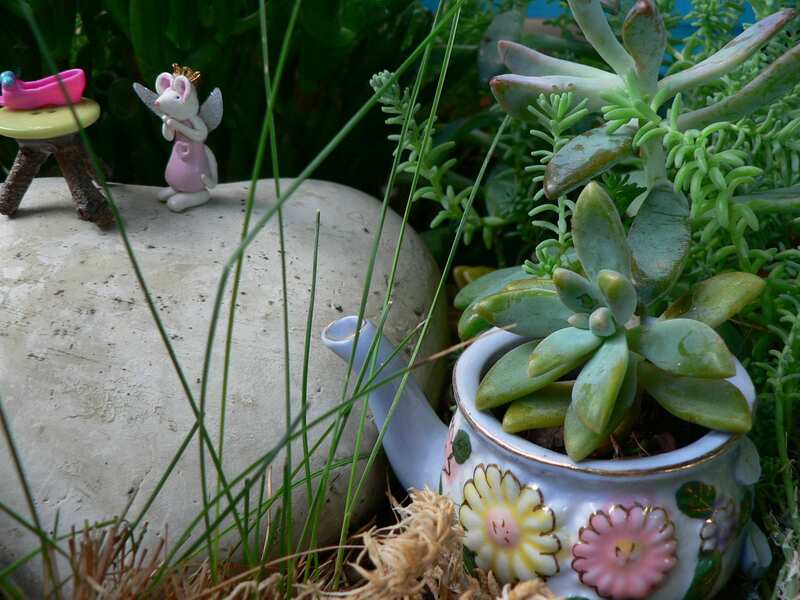 She has a thing for collections of small things…and small things and fairy gardens go in hand. 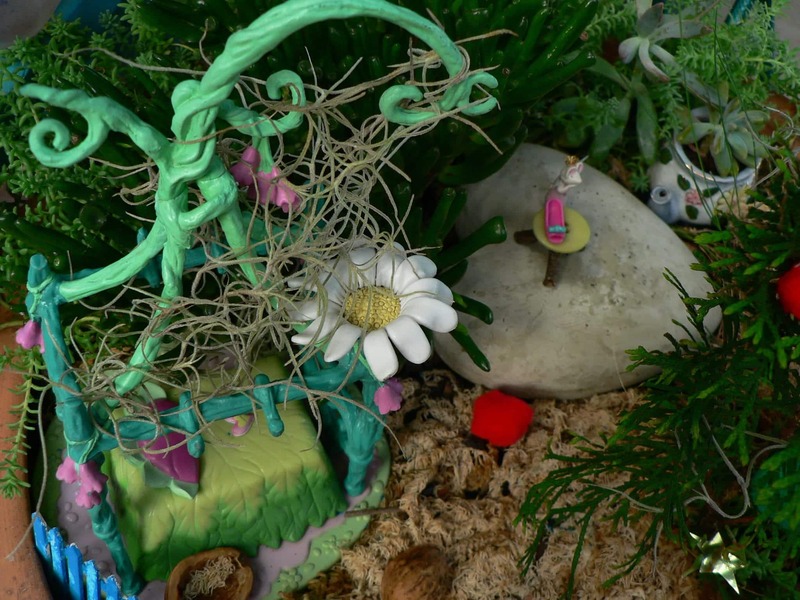 For all those who have asked…the teeny tiny fairy folk are from Oh My Giddy Aunt. We don’t own many fairy stories believe it or not – I don’t want to overdo the fairy thing lest I destroy the magic for her with overkill from a fairy loving mother. When Dan first met me I was wearing fairy wings (aged 18), I had a fairy party for my 21st Birthday (my dentist came as the tooth fairy) and I wanted to wear fairy wings to our wedding (I was talked out of this but my mum gave me the book ‘Imagine You’re a Fairy’ as a wedding gift). I don’t mind a fairy or two. 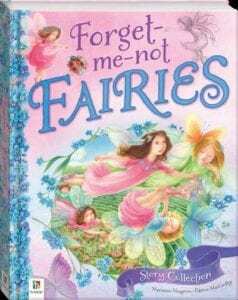 I choose my fairy books with care, so I was over excited to see that one of my favourite authors of fiction for young children, Marianne Musgrove, had teamed up with illustrator Patricia MacCarthy and publisher Hinkler, to produce the gorgeous ‘Forget-me-not Fairies Story Collection’. I have read it cover to cover and it is now under the Christmas tree for PudStar. There is an accompanying website with songs and activities here. Me thinks Pud will have that little rhyme down pat by Boxing Day. This collection of stories follows Ellen and Sophie as they explore a secret world and go on adventures with the Forget-me-not fairies and meet pixies, brownies and goblins. 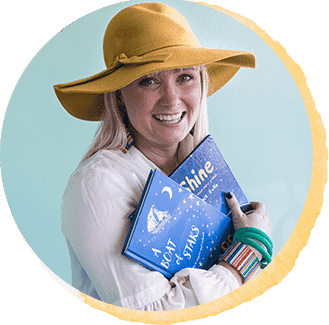 It is the perfect introduction to the world of fairies for little people and as with all her books, Marianne Musgrove’s writing is gentle, whimsical and oh so lovely. Interspersed throughout the book are songs and activities such as ‘How to Make a Flower Chain’ and a recipe for ‘Butterfly Cupcakes’. The endpapers (I know, I know I do tend to carry on about endpapers!) contain a great map of the Wishaway Wood and though of course it is PudStar’s fairy garden and not my own…I am already planning a ‘Moonbeam Bridge’, a ‘Ladybird Lake’ and the planting of some forget-me-not flowers . 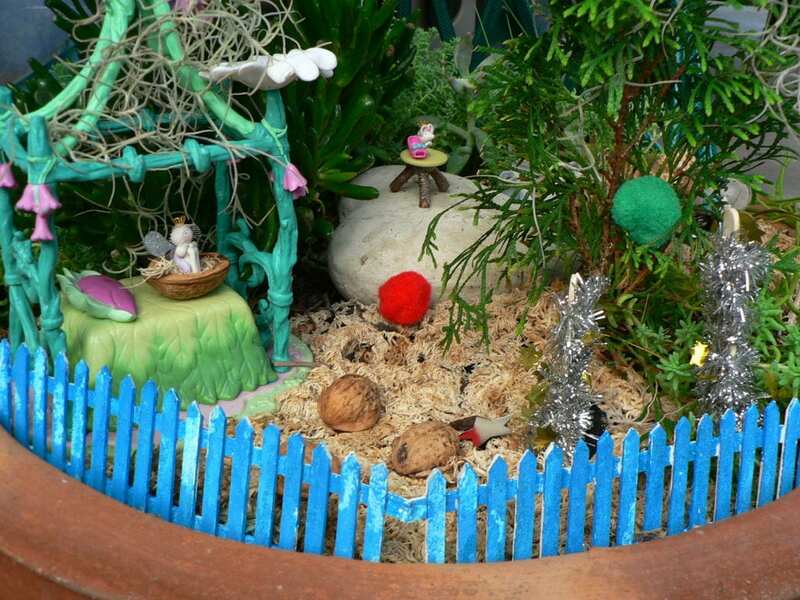 Perhaps we need two fairy gardens – it’s really not a very big pot for two sisters and one mother to play with! With her birthday coming up in March I’ve got the present sorted – a forget-me-not charm for her tooth fairy bracelet and some of the activity packs, sticker books and colouring in books from the ‘Forget-me-not Fairies’ range out in early 2014 – oh how I love a well merchandised book! 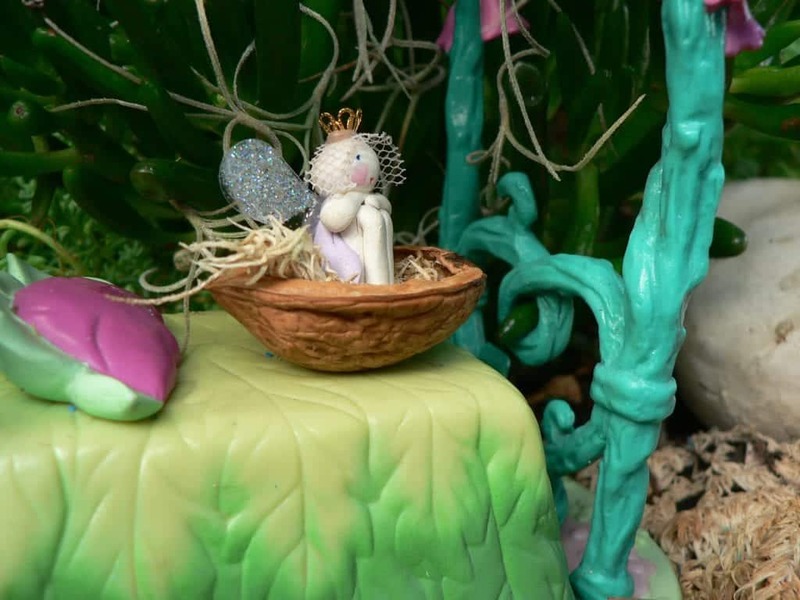 Do YOU have a fairy garden yet? Do you let your children play with it? To purchase any books click on the cover images or title. To win a copy of ‘Forget-me-not Fairies’ thanks to Hinkler, please leave a comment on this post. All terms and conditions here. This competition is now closed 30/12/12. Thank you! We don’t have evidence of fairy life yet – though I know it is there. Planning first steps with a fairy door for one of the trees in the yard! Would love this book! Oh! A girl after my own heart! Oh my glory! 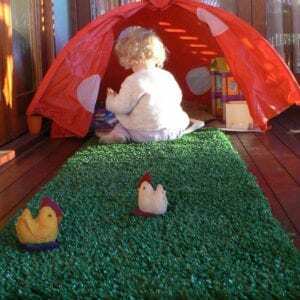 I want YOUR fairy garden! The plant in our fairy garden has died from a little too much love. We are already planning a bigger and better one with some plants that can hopefully cope with lots of love! Go the succulents! Can’t go wrong with succulents! I love fairies me can’t wait until my little is old enough so she can love thm too. I tell her about fairies all the time and would love a fairy treasury to read to her. Fairies and craft, my daughter’s two most favourite things in the world. I wish this was around when I was a kid! I would have love it too….